3/4 size Wilson leather NFL football issued to commemorate Dan Marino's NFL career passing records, autographed by Marino in black marker. Autograph has moderate age fading. Authenticated by UDA's patented five-step process including matching numbered holograms on the football and certificate of authenticity. Individually numbered #221 out of only 343 produced. 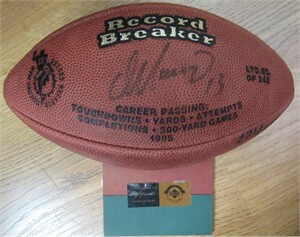 Due to the age of this football, it may not stay fully inflated. ONLY ONE LEFT.